This week (March 18-26) members of Congress will be in their home districts to connect with constituents like you. This is an important time to advocate locally on the issues you care about most. On Monday, March 11, President Trump released his budget proposal for federal fiscal year 2020 (which starts on October 1). The President's budget proposal lays out the Administration's funding priorities and values. 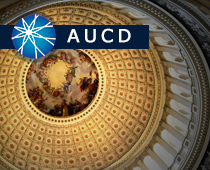 Visit AUCD's Budget and Appropriations page to learn about our 2020 funding ask. The Autism CARES Act - which has expanded research and coordination, increased public awareness and surveillance, and expanded interdisciplinary health professional training, including LENDs, to identify and support children and youth with Autism and their families - will sunset (expire) in September 2019 without a successful reauthorization. Bills to reauthorize the Act have been introduced and need co-sponsors (HR. 1058, S. 427). Currently six Senators and 25 Representatives from 14 states and territories (FL, Guam, IL, IN, KY, MA, MI, MN, NJ, NY, PA, SC, VT, WY) have joined as co-sponsors. Sample Script: "I am [Name] from [State]. I have seen the impact of Autism CARES and the lives changed because of this important legislation. I urge you to co-sponsor reauthorization. Thank you." CMS released new guidance on how they will review and approve state applications for Medicaid work requirements, including templates for would-be applicants and instructions for evaluations. CMS already has approved Medicaid work requirements in seven states - Arkansas, Arizona, Indiana, Kentucky, New Hampshire, Michigan and Wisconsin. Applications from eight other states are still pending. D.C. District Court Judge James Boasberg heard oral arguments in two separate cases challenging the administration's approval of programs in Kentucky and Arkansas requiring people to work or volunteer 80 hours a month to keep their coverage. Judge Boasberg previously blocked Kentucky from implementing similar rules. The administration reapproved the Kentucky program in November after accepting more public comments, to show it was considering feedback. Those requirements will take effect April 1 if Judge Boasberg doesn't block them. The judge said he aims to issue simultaneous rulings on both cases by the end of March. Media reports around the college admissions cheating scandal include allegations that families encouraged their children to fake a disability to get accommodations that would allow them to cheat on high stakes tests to gain college admission. The National Center for Learning Disabilities statement reflects the importance of not allowing the actions of a few families to harm students with disabilities who have a right to accommodations and the opportunity to obtain a college education. House Democrats have called for hearings to examine the role of wealth in admissions. Reach out to your Representatives and share the importance of ensuring access to accommodations for students with disabilities. Your voice is needed to ensure that disability policy is part of the campaign. For candidates who are currently in office, share and elevate their position on key disability legislation as noted above. Tip: You can and should ask them to support bills of importance. Tuesdays with Liz: Contacting the 116th United States Congress! As you advocate for Autism CARES reauthorization, prepare to attend DPS, and engage in campaign 2020, review a classic TWL episode about sharing your voice for tips and inspiration.